My next tips and tricks video covers strategy for the Peggle Master Jimmy. Read my Peggle review here. Hi Everybody! It's Ryan from ryviews.com, and this is the next tips and tricks video for Peggle. This entry is focused on Jimmy Lightning. There's a link to my Peggle review in the video description. Jimmy is not one of my favorites, but there are definitely situations where he can be pretty useful. He has an immediate effect and no lasting effect, so he's definitely a master where you need to inspect the green locations before choosing him. If the green pegs are too low, you won't get good use of his power. However, one very nice perk is that if you're able to land both the balls into your bucket, you get 100,000 style points, which is one of the biggest style rewards you can get. That can be hard to line up, but you can try to find a spot that will have them pool together on a ramp or something, that will at least pretty much guarantee that they'll fall together, effecting turning them into musketeer balls. (That was an "All for one" joke, in case it wasn't funny). If you're able to hit both greens in the same shot, you also get a hefty style bonus, and that can obviously give you 3 balls of destruction. That can have tremendously good consequences if you're able to do that after you get a 2x multiplier. Obviously that can be kind of hard to set up but it really can be worth the effort. I get frustrated trying to line up his greens like that, but if you put in the necessary time you can pretty much use him to ensure a nice big score for a level. 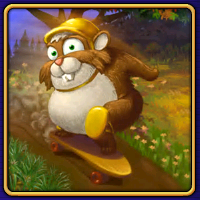 On the Peggle Master Leaderboard, I'd put him in 6th. Thanks for watching everyone. Visit www.ryviews.com for more content and don't forget to subscribe.